This stunning Tanned Cowhide Wash Bag from Muhle has been designed in the style of old-fashioned binocular or camera cases, very stylish! This is a stiff wash bag, most suitable for home storage of shaving and grooming items as well as formal travel and comes with a handy chrome hanging hook. This case comes with an inner sleeve which is designed to hold your brush, razor, blades and shaving cream tube. The sleeve however can be removed to make even more space. The Wash Bag is made by a regional manufacturer in Germany from start to finish using a rare edge-sewing machine. 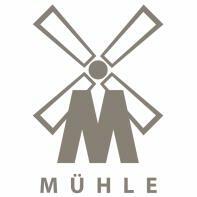 The leather has not been treated and is stained tan colour by a method using vegetables, this makes each one unique, but as with all Muhle products, will be long lasting and of the highest possible quality. The leather for this case was tanned in Germany and painstakingly processed into a high-quality product in order to retain its natural characteristics. Slight variations in the colouring and small scars are features of the natural material. The case fastener on the outside becomes more supple with time. Slide the fastening button through the hole by pressing the edge of the hole with two fingers. We recommend applying a razor-thin coating of care cream or grease for untreated leathers and then lightly polishing the case with a soft cloth. Products from Burgol or Saphir are well suited for this purpose. This is a different, stylish and hard wearing wash bag - we love it! If, however, it's not exactly what you're looking for, click here to browse our extensive range of wash bags and wet packs.